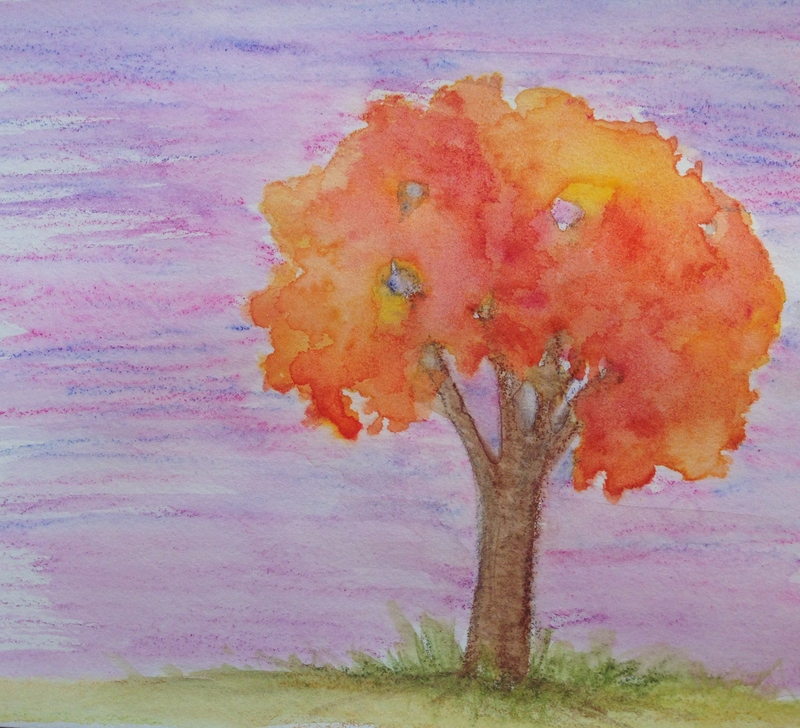 My first watercolor tree attempt. I think. We could all use a laugh in the morning, so feel free. :)) This is neo II crayons and my Cotman travel palette of watercolors in my art journal. At the beginning of summer, I promised myself to improve my florals by season’s end. Although they’re nothing to write home about now, I do feel like there was improvement. So trees are my fall goal. And leaves! Remember BB’s 30 day leaf challenge? I’m gonna join her in that. I collected some (admittedly uninteresting) leaves on my walk today, so I’ll try drawing them later tonight. Ours aren’t really changing yet. Oh, but when they do……ooh. I will have to post photos. Peace and Happy Tuesday to all! Trees are a good challenge. Leaves are easy for me, but somehow groups of them on a tree give me trouble. But this definitely looks tree-like. Ooh, looking forward to learning more about leaves from you. I did my first one last night and really enjoyed it. Definitely a challenge. Not much different from florals, IMO. Glad I practiced those for the last few months! I find them easier than florals. Maybe I’ve just drawn more of them. They’re much easier to find everywhere, and at any time! True. I’d have a crispy garden. Or none! Beautiful tree. Love the colors on this crisp morning!! Happy Fall day beautiful! Jodi, you’re so sweet! Thanks, milove, happy autumn wonderment to you too! What a happy painting. You’ve captured the essence of fall. I will look forward to your leaf painting. They are small but can offer a challenge! Enjoy your day. I really like your tree. I am not an artist but I enjoy drawing trees. I’m happy to hear you will be working on trees this fall! Thank you for the encouragement! I’m really glad you like this! I like the colors in the leaves but I struggle with branches and reality in trees lol. Trees are more fun to draw out of my head. Is that how you draw yours? Yes! Most of the time I draw out of my head. Every now and then I’ll actually sit near a tree and draw. Realism is not mentioned around my tree drawings!! LOL realism is overrated anyway!! Can’t wait to see your progression with drawing trees — I love trees and they have such varied personalities -))) Good job! Fall leaves are so gorgeous! I think your tree looks fabulous! Can’t wait to see all your leaves! Thanks, Kari! Will you be doing any leaves or trees this fall? I have done a fall leaf already and I’m sure trees will be soon! That is a solid tree. I like it. Why would I laugh? You did wonderful foliage! Keep at it! Thanks! I like the foliage but not the wooden parts lol. I’ll keep trying! Leaves are fun too. Ooh, that sounds beautiful! Can you post a picture? I’ll do that for tomorrow’s post, Laura; thanks for asking! Thanks Rebecca. Got a ways to go yet with the trunk and branches. Can’t wait for the leaves to change here. Are they changing there? Thanks C! I’ll paint lots more; I’m glad you liked this one. I was happy with the foliage part. don’t be so hard on yourself, Laura! you remembered to leave holes in your foliage, and you have good blending of colors. remember, doesn’t matter if the leaves are boring, you can paint them however you’d like them to be. just get the basic shape down! This is so beautiful, such a wonderful color combination, and tree colors are so striking! They’re still green here, too, this was painted from an example in a book about painting trees in pen and ink and watercolor. I just decided to start with wc crayon instead and then added the foliage in watercolor. I’m glad you like this, Ann! I hope our trees will start to look like this soon! Your first watercolor tree? It is gorgeous! Love the way you varied both your colors and the silhouette, even leaving a few sky holes as well. It might be your first watercolor tree on paper, but you must have bee painting them in your heart for some time. Peace. I have loved them since I was little! What a nice comment, full of soulful gentleness. Thank you so much! Trees are terribly hard (at least I think so). For your first watercolor tree… this is amazing! Just absolutely love the colors, So warm and welcoming!! Thanks, BB! I love trees so much. I’ll be really happy if I become a better tree painter by the end of fall. I am really enjoying the detailed leaf studies, thanks to you! I might have been sad for all of the flowers I will no longer be able to just go out and sketch, but now that I’m focused on leaves, it’s a whole new horizon opened up! I hope you come up with something! I guess pine cones could work, but talk about a complex subject! What about rocks? Or even twigs? I hope you come up with something great! I may just tag along! Another cool one could be shells. We’ll be going to the beach, and I could collect a bunch of those. Ooh, and cool pebbles/rocks then too. Might be a nice reminder of warmer weather in the dead of winter! But I’d like to see what you come up with! Oh yes, I love the shells and pebbles/rock idea! I have so many collections of shells in my studio that are begging to be drawn. I’ll keep thinking of ideas, but I do like this idea of yours! I’ve never tried to draw a rock at all, but I feel like I’ve seen posts where you have and they were gorgeous! Makes me want to try them. I’m glad you like those ideas! They’d be cool subjects! Wonderful subjects! And, yes rocks are fun to draw. Especially ones that are interestingly shaped or colored! Not sure how easy they’d be for me to find, though……my neighbor has a stream, that’d probably be a good place to try. I love the availability of leaves! hehe. But if I could collect a bunch of them at the beach….that’d be such a great way to bring the beach into the winter. Great suggestion! Yes, I definitely will. Good idea – I usually collect shells, but never thought to add rocks! Or pebbles. Would be cool.